In the summer having a dish you can whip up quickly is nice, especially if you don’t have to heat up the whole house to do it. An added bonus is if you can use up some of your tomato harvest. 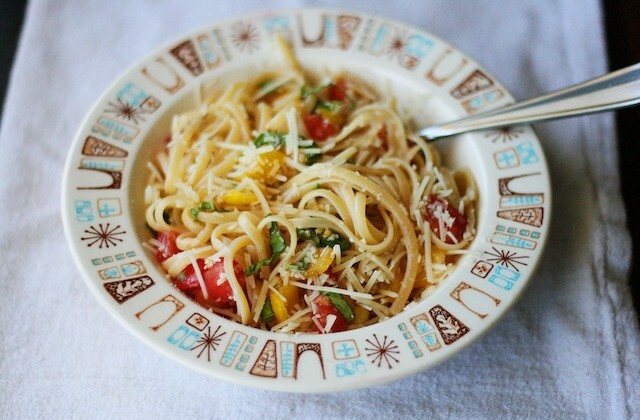 Well if you have extra tomatoes on hand this pasta will help you use them up! 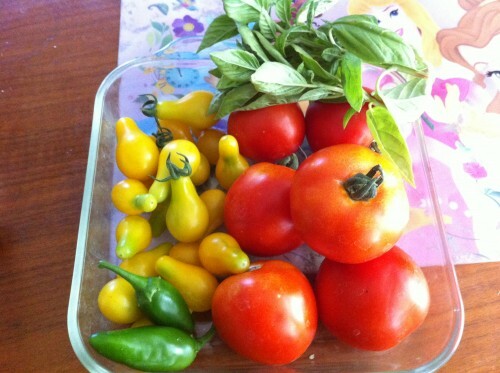 My yellow pear and Early Girl tomato plants have been so good to me. Every day the girls and I pick tomatoes. A fair share of them have been turned in BLTs (my all-time favorite summer sandwich), while many of the yellow pear tomatoes have just been eaten as is -still warm from the summer sun. Yum! 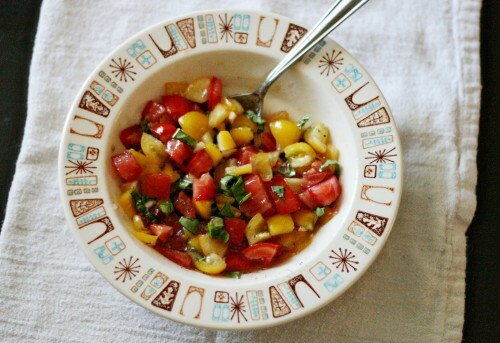 I used both yellow pear and an Early Girl tomato for the bruschetta. You could use any combination or variety of tomato that you can get your hands on. This light dinner is done in the time it takes to boil your pasta. On the table in 15 minutes or less. What kind of tomatoes are you growing this summer? Boil up 4 servings of your favorite pasta according to package directions. I used linguine. Drain the pasta and place 1 serving in a dish. Toss with 1/4 of the bruschetta mixture. Garden fresh tomatoes!! I am still waiting for some. Soon!